Proudly sporting a “pro-rider developed” logo, the Madison Road Race gilet was created over the course of the 2014 season in conjunction with the Madison-Genesis team. With a front panel made from ripstop nylon, protection from chilly winds is superb, while the mesh rear panel allows hot air to escape from your torso – perfect for days when a stiff breeze rather than cold temperatures are your main enemy. Like on Endura’s similarly priced Equipe Race gilet, Madison has opted to include a single large zipped pocket at the rear, which is impressively waterproof to keep your valuables dry, and is also stitched into the main fabric of the Madison Road Race gilet, meaning it doesn’t swing about and bash against your back with your phone and wallet acting as a pendulum while you climb out of the saddle. Despite the extra material needed to include a pocket in the design, this gilet still packs down more than small enough to stuff into a rear jersey pocket once the temperature started to rise. However getting it back on was not always so easy, with the stormflap getting caught in the zip pretty much every time we used it. That said once we’d got it on, the Madison Road Race gilet was barely noticeable, with the slim fit ensuring no excess material was left flapping in the breeze. 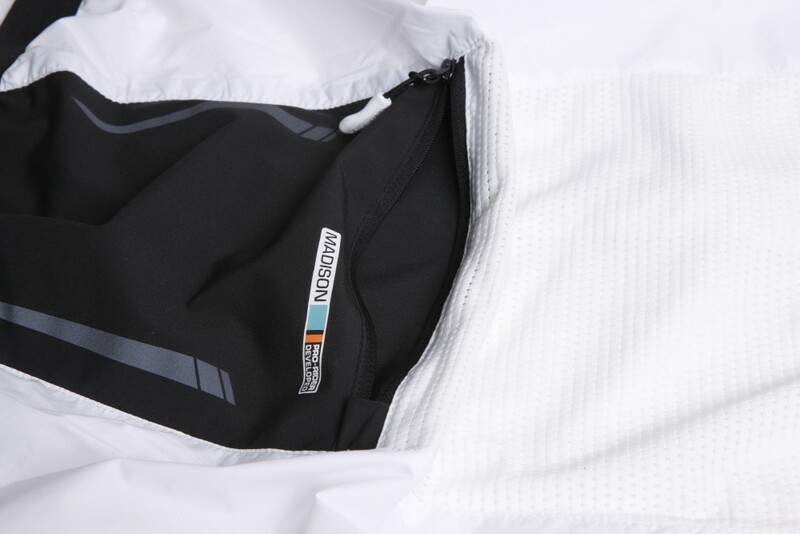 Windproof, packable, and with a large zipped rear pocket, I was really impressed by the performance of the Madison Road Race gilet. However the storm flap getting caught in the zip is a niggle that could become a real annoyance with long-term loose.